Movie: The Neverending Story (1984), The Neverending Story II: The Next Chapter (1990) and The Neverending Story III (1994). Bastian Balthazar Bux is bullied at school everyday. He’s a bit on the chubby side, he doesn’t have friends and, of course, he’s not popular at all. To make it worst, he doesn’t even have his father’s support. Since his wife’s death, he’s been neglecting his child and is in no condition to even notice something is wrong with Bastian. 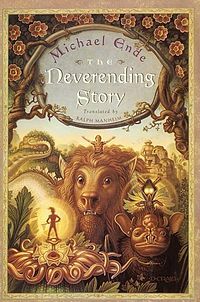 One morning, while running from bullies, Bastian gets in an antique book store and meets the owner, Carl Conrad Coreander, who has been reading a book called The Neverending Story. When Mr Coreander leaves him alone with the book for a moment, Bastian has the sudden urge to steal the book and runs immediately to the school. Once he arrives there, he decides he doesn’t want to go to class. Instead he hides in the attic and starts reading an story more addictive than he ever thought possible. At some point, he even starts thinking the book is talking about him or speaking directly to him. Even some things he does or say seem to be written on the book, as if it has been writing itself in that same moment. Can that be true? As he reads more an more, he will finally stop to be a passive reader to take part in a wonderful adventure he will never forget because he has been chosen to save the world of Fantastica. Can someone like him complete such a difficult task or will he be lost forever in the Nothing? All characters are perfectly outlined. There are characters you will love and cry for and some you will hate with all your might. Also the whole bunch of magical creatures and its stories are very good and imaginative. Bastian starts as being childish and a coward and goes under a very big development and maturity process during all the story, which really is the final goal of the book: a learning experience for Bastian. You will petty Bastian, love him and even hate him. He will succumb at times to temptation, he losses his way at some point and will have to try hard to find the right path again. In a world of fantasy, we will learn through Bastian about the ups and downs of life and the human nature. The whole development process of Bastian. It’s incredible once you realized how much he has changed in the end. As Bastian travels the world of Fantastica to save it, he will encounter lots of creatures and stories that are put there as a test for him. So we get to enjoy the main plot as well as a lot of side plots equally interesting and important. Deals with all aspects of human nature. The book is written in two colors so you know when you are reading The Neverending Story and when you are reading Bastian’s reality. That is so cool! I think it’s perfect. I don’t remember anything wrong. At some point, I was very angry at Bastian, but that was how it was supposed to be, so I think the story does what it has to do. 10 out of 10. I think it is one of the best fantasy stories of all times. Just don’t see the movies. They are crap. Or at least read the book first.